Oh, wow...that looks really good. Super good. I would love to get my hand on some of that truffle cream!! Mmm. I've never actually cooked with truffles (in any form), but I do love the earthy flavor when I get the chance to try some (so far I think my favorite has been a mac-n-cheese drizzled with truffle oil. But then I love basics when they are dressed up). Oh, I'm a truffle lover too, and can only imagine how good these potatoes taste and smell because they look incredible. 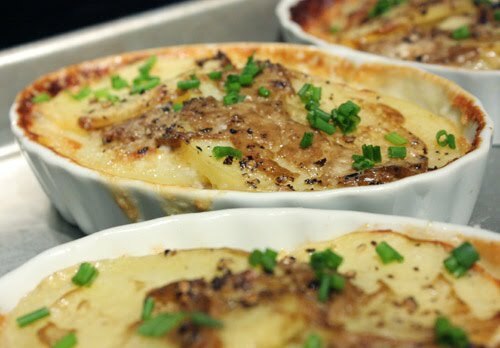 I've got some of that truffle cream left and I love the idea of using it in this potato gratin. Potato gratins with this white truffle cream sounds just heavenly! Excellent! I just love the aroma and taste of anything with Truffle Oil drizzled on it! I'm going to have to get some of this Truffle Cream. It sounds amazing! I can only imagine how good these potatoes smell and taste! 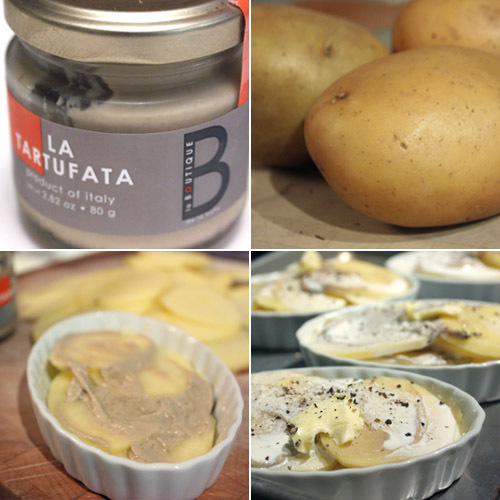 Potato and truffle, that's awesome! 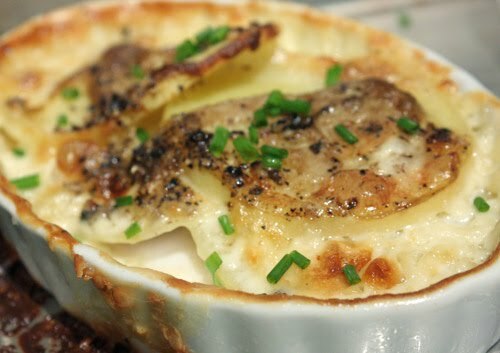 Your gratins look so scrumptious! I am going to try these for a dinner party.....I bet the smell was fantastic! My mouth is watering just reading your post! I would like to make a meal of just these potatoes! I am right there with you on the truffles and truffle oil! These I'm sure were SO GOOD! That is a great looking combo! I have to confess that I have only once tried truffles and they were a little bit old... :) So I can't say I was very impressed with the flavor at the time, but looking at this little dishes I am very tempted to try and find that truffle cream! Very luxury potato gratin making it stand out the crowd! BTW, I saw you have got the book on 'I Know how to eat', is it very good? Is this recipe divine or what! I love the truffle flavor too- even have truffle salt on the table. But potatoes and truffles? Yummy! And it looks so creamy and delicious. What a divine potato dish & so festive too, Lisa!! Lovely! Thanks for another grand recipe! Kurt's comment is funny. :) I recently made a similar comment about a friend who loves anything batter-fried, tempura-style. Potato, cream, and truffle make a great combination. This looks absolutely delicious and fit for both intimate and formal parties. Congrats on having the self-restraint. If La Tartufata ever sends me a jar of this, I doubt I can keep myself from going at it with a spoon. Ha my husband said something similar! Lets go to Alba right now...I did smuggle three home a few years ago with the help of a chef friend over there...ummm cheese, cream, potatoes! The first time I tried a real truffle was in Paris and it was atop pasta. I truly understood what all the fuss was about. I can' even imagine the pairing with potatoes. What a delicious dish! What a delicious dish! You really let the truffle flavor shine through! Wow truffle! The flavours must be amazing. Terrific recipe. Excellent use of the truffle cream!